The European Domestic Agency/CIEMAT/Asturfeito S.A. team in front of the JT-60SA cryostat vessel body. The cryostat vessel body of the JT-60SA tokamak has been successfully manufactured and pre-assembled at a factory in Spain, and will soon be transferred to the JT-60SA site in Naka, Japan, for final installation. This large containment vessel, formed from 12 sectors, will provide thermal insulation and a vacuum environment around the machine's magnet components. The JT-60SA tokamak is part of the Broader Approach agreement signed between Japan and Euratom, and implemented by QST Japan and the European Domestic Agency for ITER. It represents an upgrade of a previous tokamak at the Naka facility, designed to support the operation of ITER and to investigate how best to optimize the design and operation of fusion power plants built after ITER. First Plasma is planned for 2020, at the end of a six-year assembly and commissioning period. 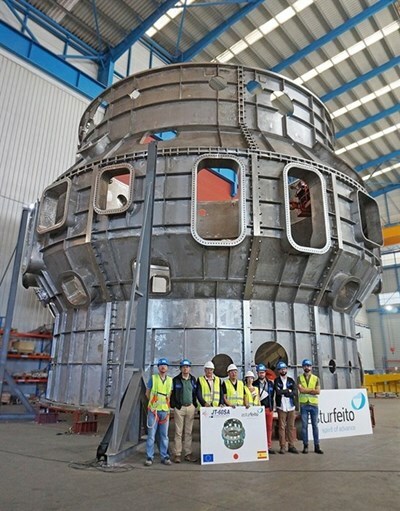 The cryostat vessel body has been procured as a voluntary contribution to the Broader Approach Agreement by Spain (through its national fusion research centre CIEMAT) and manufactured by Asturfeito, S.A. Once assembled in Japan, it will be capped by a top lid procured by QST. Pre-assembly at the Spanish facility allows stakeholders to be sure that all tolerances have been respected and that re-assembly at the Naka site will proceed smoothly. The 12 sectors are expected to arrive in Japan at the end of the year, between December 2017 and January 2018. See the full report (and video) published on the European Domestic Agency website.